When you create your account you start on the free plan. No credit card details are required. When you’re ready, you can upgrade your team to a paid subscription. For more details checkout our pricing page. To ask if you can access a free trial for 14-days, please contact support@avaza.com. You can click the green Upgrade Account button in the Menu Bar. 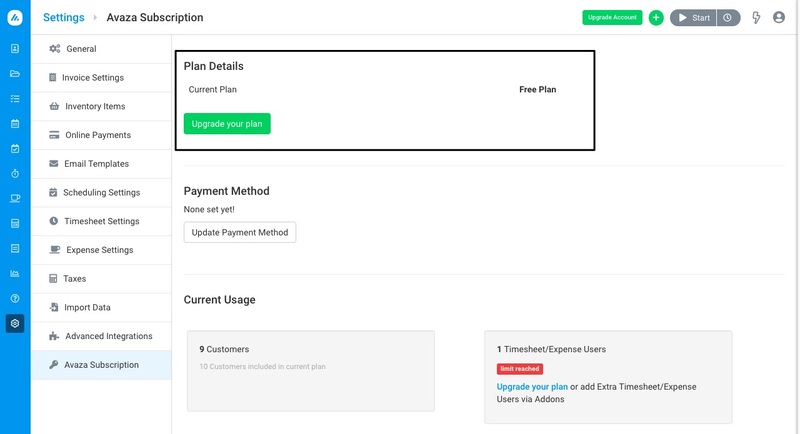 You can also upgrade by navigating to Settings > Avaza Subscription page. You will be asked to enter credit card details if you select a paid plan. 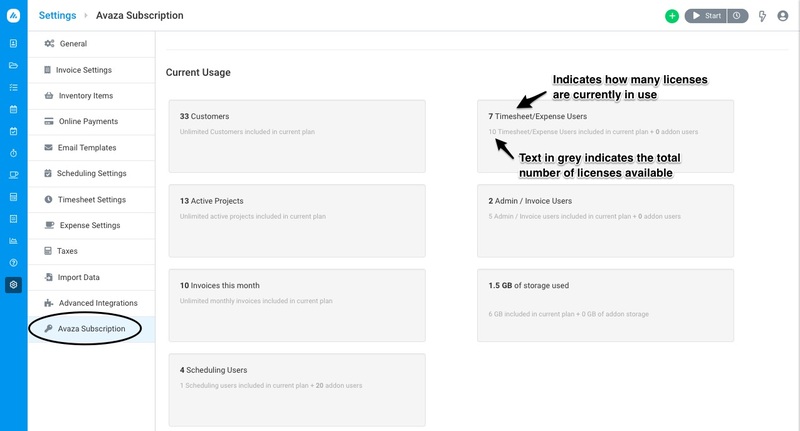 Under Current Usage, you can see the number of customers, expense/timesheet users, active projects, admin/invoice users, invoices,scheduling users, and data usage against your account, as well as the limits your account has. You can also manage add-ons to your accounts, such as extra data, additional licenses or advanced integrations you have added above and beyond what is available in your subscription. You do not need a credit card to sign up for Avaza, but if you upgrade, you can pay for your subscription via a credit card or PayPal account. Your payment method will be charged on or around the Anniversary Date mentioned on the Settings > Avaza Subscription screen. The Anniversary Date is the day of the month on which the Subscriber first switches to a paid plan, and therefore becomes subject to an Account Subscription fee. This day of the month corresponds with the beginning of each Billing Period. We don’t store your credit card details at any point on our servers. Avaza uses one of the leading payment gateways to store and process all its financial transactions. Go to Settings > Avaza Subscription page to downgrade or your account. To downgrade your account to a Free Plan, first ensure you meet the limits required for that plan. This can mean removing extra users, projects, customers and data. Remove extra licences and data allowances from your account under the Settings > Avaza Subscription > Manage Plan Add-ons section. To downgrade your account, click Change your Plan > Choose appropriate plan on the following screen. Note: There is a 1-day waiting period after you change your subscription before the next change can be made. You can also contact support@avaza.com to facilitate this process. In the event that we are unable to process a charge on your payment method, you will have an opportunity to update your payment method in Avaza. We will try 3 times during a 14-day period to recharge the payment method. If, after 3 attempts in the 14-day period, we are still unable to charge you, we reserve the right to deactivate your account. For 30 days following de-activation, you can reactivate your subscription by updating your payment method and paying all outstanding fees. We reserve the right to delete accounts that have been overdue for longer than 45 days. If you need any help with your Avaza subscription, or want to better understand our pricing, please contact chat support or email support@avaza.com.